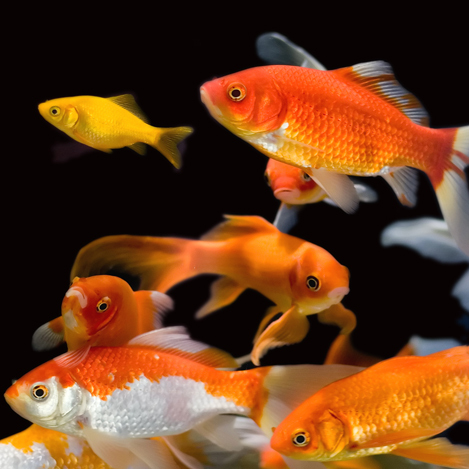 Common gold fish, are cold water fish for ponds or tanks. They can grow up to 26-30 cm / 10 to 12 inches. They live in water parameters of PH range 6.5-7.5, and temperatures of 17-22 Celsius / 65-72 °F. Common gold fish are peaceful. However they can be very quick moving around the tank or pond, so they are better mixed with other quick moving fish. They are a hardy cold water fish and a good fish for beginners. They are a form of domesticated wild carp and are a close relative of koi. They come in a variety of colours including red, orange, yellow, white, black, and calico, which is a mixture of all the colours. They look the same as the comet gold fish just basically have smaller fins and bigger fatter bodies. They are greedy so will eat any food you put in for them, like flakes, pellets, and granular foods. Also treats of frozen, or live foods is always nice for them. They can go in to indoor fish tanks or out door fish ponds. Goldfish get very big mouths they will eat anything that will fit in to there mouths. So granular food pellets and sticks are good for them as well as flake, and treats of live and frozen foods. They can be feed off the surface of the water or they can foridge in the gravel for food. So sinking or floating foods can be feed. Common gold fish only need feeding once a day at the most.